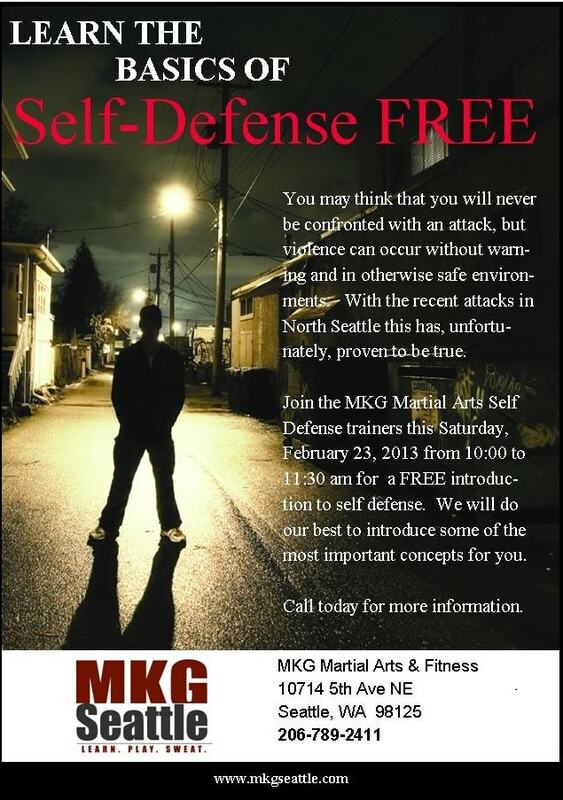 Join us for a FREE self defense class / training workshop in North Seattle this Saturday, February 23rd, 2013. We had intended to conduct one of our full weekend Self-Defense Training workshops this spring before news of the attacks in North Seattle was released last week. We have instead decided to do an emergency FREE community service mini-workshop as time is of the essence with the attacker still at large. Please join us on Saturday morning February 23rd from 10:00 to 11:30 am for a FREE self-defense primer conducted by the MKG Martial Arts Seattle self-defense trainers. We will be opening this one up for women and men as the awareness and avoidance training is appropriate for all people. UPDATE: We had over 100 people attend the free introduction on 02/23/13. The FULL course has been booked for March 30 & 31, 2013. Space is limited. Please register on this event page to hold your spot.